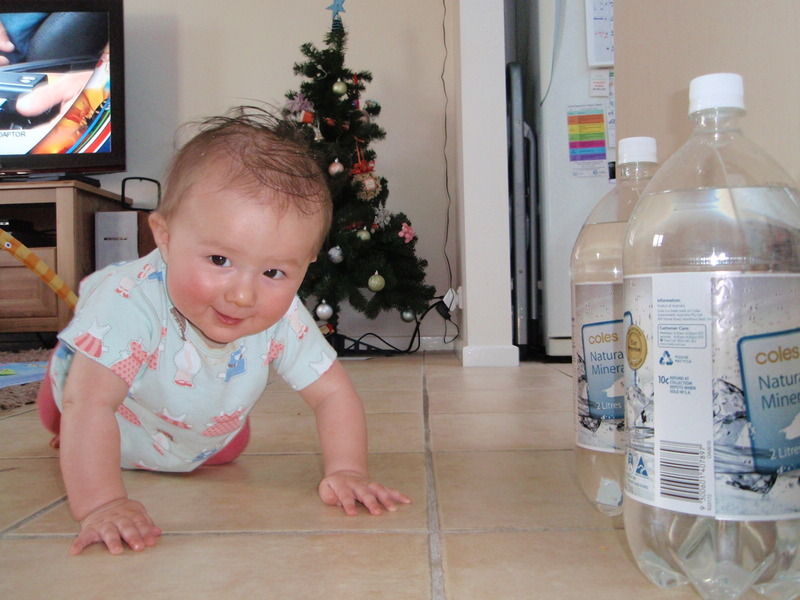 Arddun's main motivation for movement: big bottles. Inspired by a colleague’s 365 project and her maiden voyage into blogosphere (shameless plug! ), I had a look at my life and my posts, and decided that I really haven’t been counting my blessings all that much. Hence my attempt at doing some thanksgiving regularly. Welcome to the inaugural Thursday’s Three Thank-yous – or 365-lite, if you will. I know I have enough trouble trying to blog more than twice weekly as it is, so blogging a thanksgiving daily is out of the question. But weekly accumulated thank-yous are okay. Weekly accumulated thank-yous are manageable. And they force me to distill the essence of the week and recognise my kairos. This week’s Triple-T is easy. I’m thankful to God that he’s given Arddun an abundance of energy and baby strength so that in 24 hours, she taught herself how to sit, stand and crawl in that order. I know it’s cheating to have the one major event count as three separate blessings, but they’re each pretty major milestones to me, a n00b mother, so I thought I’d give each its due credit. Having her suddenly be heaps more mobile and independent has also opened my eyes to the myriad of ways that God’s kept us safe daily. I cannot remember the number of times she’s lost her balance and hit her head or her face on the floor, only to come away a little tearful but none the worse for wear. As much as I’d like to dress her in bubble wrap and make her wear a baby helmet, I know the ultimate insurance I have is a God who holds the world in the palm of His hand. Thanks for the plug!! Glad you are doing your own spin on it! It is soo nice to take 5 and just be grateful!! !